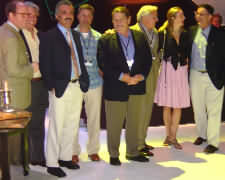 Antiques Roadshow appraisers and show host Mark Walberg. After Appraisals. 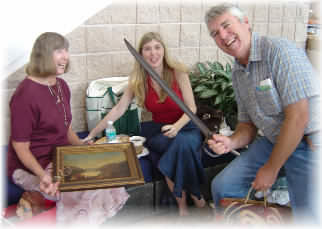 Attendees with a worthless sword, and a $300.00 oil painting. Among Tampa's big finds were a James Buttersworth marine painting valued at $250,000, carnival canes at $200.00 each, the entire collection between $5 -7,000, and Davy Crockett;s marriage license at $20,000  all the more interesting since Crockett was jilted at the altar! Above: Circa 1830. Not quite Coalport, but still valuable. Arts and Crafts rocking chair. 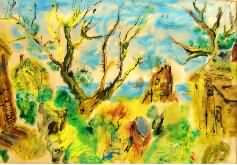 Lawrence Kupferman Watercolor, (1909  1982) Old Tree by the Sea. Modern American. An incredibly complex and fanciful work with ghost ships, tree monsters, air, trees and sea. It measures 31 1/2 X 21 1/2.